Ok. Are you guys ready for this full SITUATION? So, to catch you up, things just got weird yesterday on instagram. Someone asked me a innocent question (Q: do you have matcha every single day?) and before I knew it, I was pulling everything out of my bevvie closet, like nobody’s business. Showing you alllllllthethings. All my favs. I guess I can’t avoid it any longer. I–100% –have a bevvie obsession problem. You know this, if you follow anything of mine: the multiple cups by my desk at all times, the armfuls I take in and out of the car everyday, the majority of my fridge that’s filled with them. It’s the #bevvielady, coming in hot. Which is hilarious (probably only to me), because I literally used to only drink water (and sometimes wine), because otherwise, what a waste of space. Everyone knows food and chewing are so much better. But, that was before I realized that drinks could be healthy too (not just full of sugar and crap). And filling, healing, easy and straight up delicious. But really, did I say super E-A-S-Y? Because life these days is packed, so I’m all about being efficient wherever I can. Physically, beverages and drinks are easier on your body to digest and can be packed full of healing, amazing superfoods. It’s full of all the good stuff, but pre-broken down, so that it’s nicer and kinder on your body. And I, for one, def need all the help I can get in that area. More on that for another post later, promise. So now, you’ve seen my crazy (and the favs), so let’s get into the details. 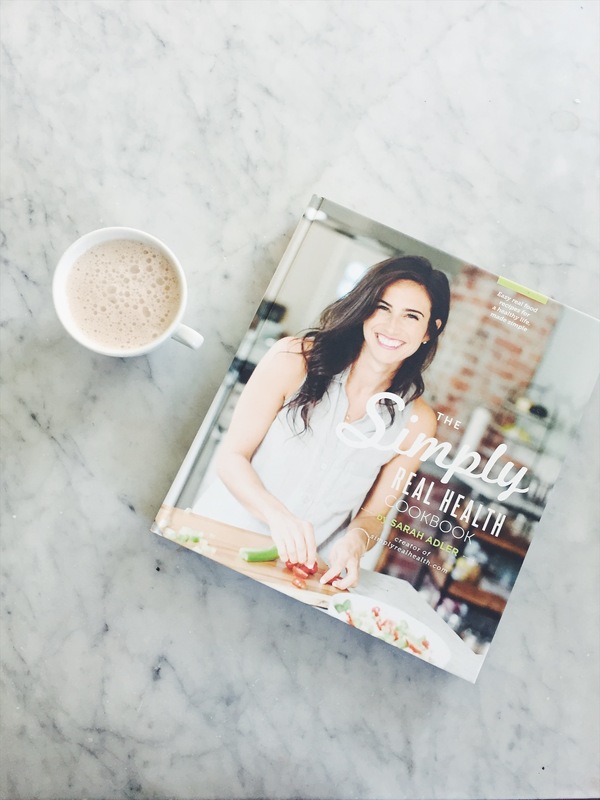 Aka, more than you ever wanted to know about all of your great OPTIONS for morning drinks that will help fuel, energize and radiate throughout your day. You guys know I am obsessed with my Matchaful matcha. And no, they’re not paying me to say that. The reason is this: they are a 100 % organic, small batch, a micro-small, #ladyboss run business, and it’s the best tasting brand I’ve ever tried, hands down. Their Emerald version is great for matcha pros, and their Jade version is perfect for beginners who might be worried about the more bitter taste. Also available in handy single serving packets for travel. There is less caffeine than coffee, for sure, but you definately get a little calm, cool and collected buzz. And sidenote: with matcha, you get what you pay for. So get the good stuff, it will be a little more pricey, but it’s worth it for the things you’re therefore avoiding. Plus, because I’m a raving freak fan, you can get 15% off your 1st little order by using the code “simplyrealhealth” at checkout. 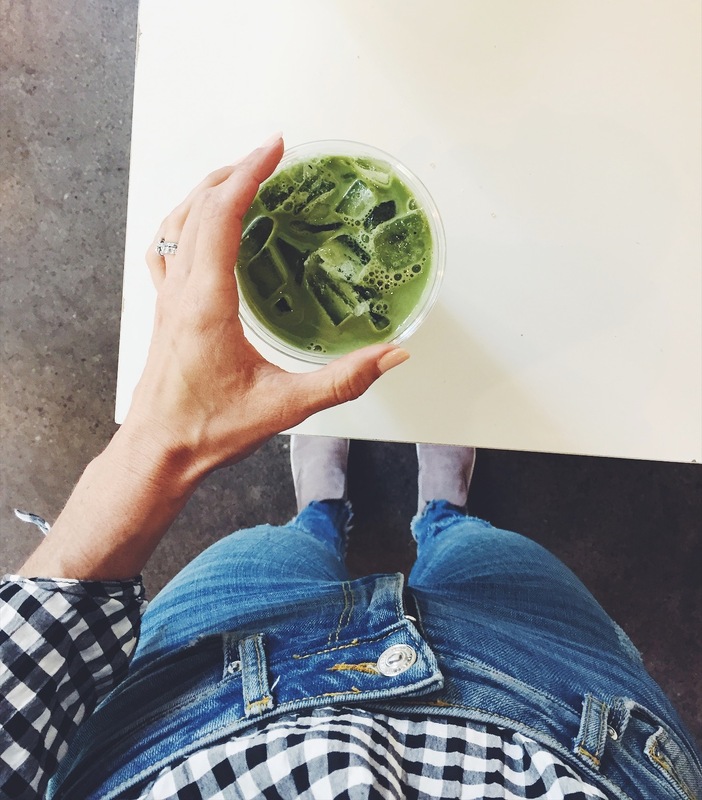 Curious about matcha? 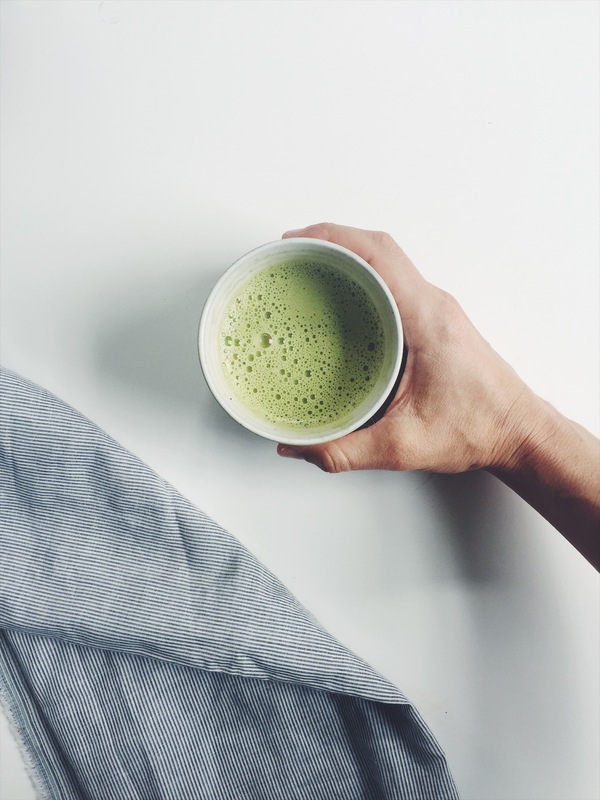 Check out these past posts I’ve done on matcha, and fav recipes to make at home here and here and here and here. My current fav combo? 1 heaping teaspoon emerald matcha powder + 7 oz cold water + 1 oz coconut water + 1 teaspoon brain octane oil, blended and poured over ice. Chameleon is my favorite organic brand, and the most widely available one. Cold brew has so much less acid than regular coffee or espresso, because of it’s longer and more gentle processing methods. I (and a lot of people) who can’t tolerate coffee very well, do great with coldbrew, in moderation. Think no jitters, no anxiety, no seeing lines, or upset stomach. All the amazing, no downside. Please and thank you. My fav combo? 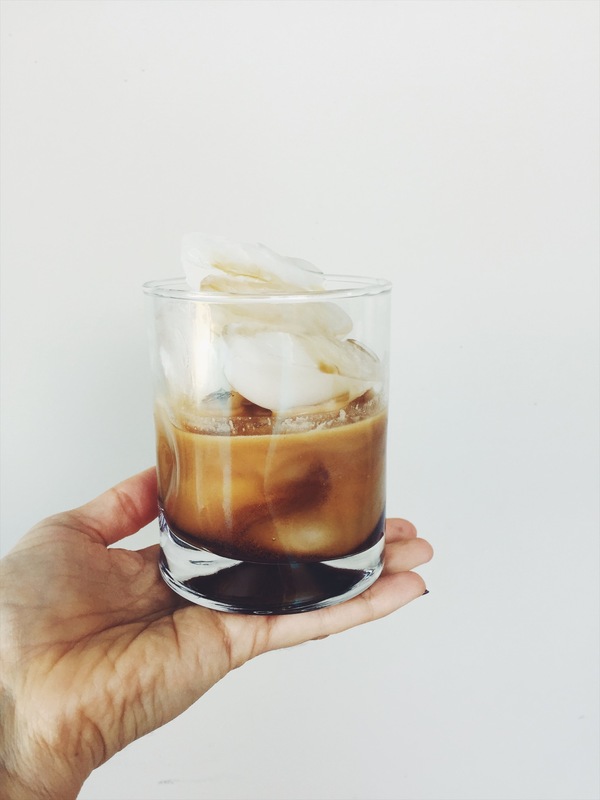 I adore coldbrew iced with coconut water or heated with 1-2 teaspoons of grass-fed butter/ghee and collagen peptide powder and blended (see below). Ok, WEIRD, right? What the heck is mushroom coffee? Well, you can read/watch all about it here, on the Foursigmatic website, but basically, there are certain types of mushrooms that have some legit healing properties to them. They’re called “adaptogens” in the health world, meaning that they train your body to get better at regulating itself (hormone wise, blood sugar wise, mood wise, etc). The most common of these mushrooms are called Lion’s Mane, Chaga and Reishi. They’re really all the rage at the moment, but this point is this: like coldbrew coffee, mushroom coffees are super clean, distilled and have so much less acid, risk of mold toxicity, etc. 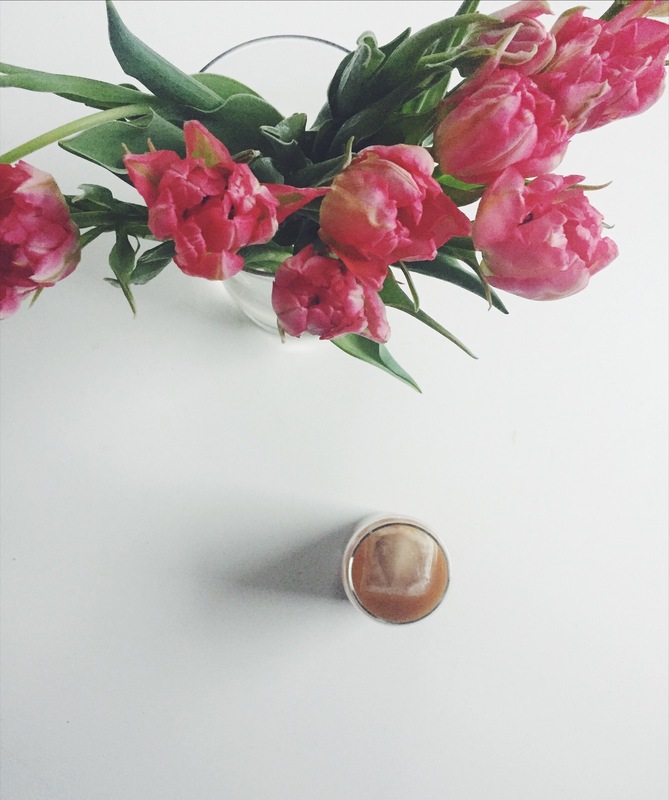 And for those more sensitive to usual coffee, they’re an amazing option! I can’t do regular coffee, but do great with my Foursigmatic Lion’s Mane Coffee and the Mushroom Hot Cacao versions. My fav combo? mix 1/2 a packet of each of the above with 8 oz hot water a little coconut oil and blend. Or iced by blending with cold water and 1 teaspoon of brain octane oil (below).You’ll thank me later. 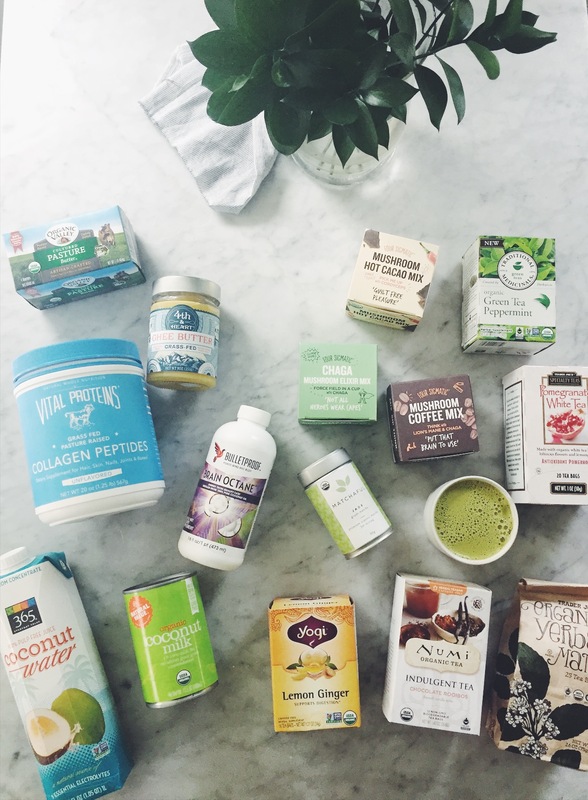 I’m also a GIANT fan girl, so you can get 10% off your orders with the code “simplyrealhealth” at checkout. 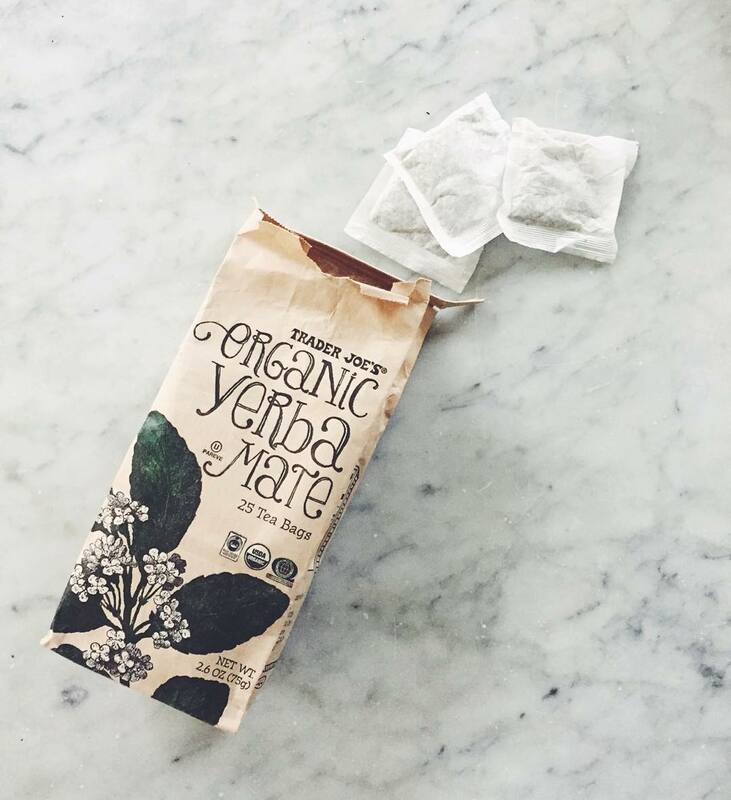 Yerba mate is a tea from that comes from South America, and it is like WHOA on the energy scale, but with less caffeine and side effects than coffee. My fav combo? I add a few teaspoons of the loose leaf (like this), with water in my french press and brewing like coffee. From there, you can have it hot or iced, with a touch of honey/maple or coconut water (my pick), or turned into a little superfood latte with any of the mixers below. 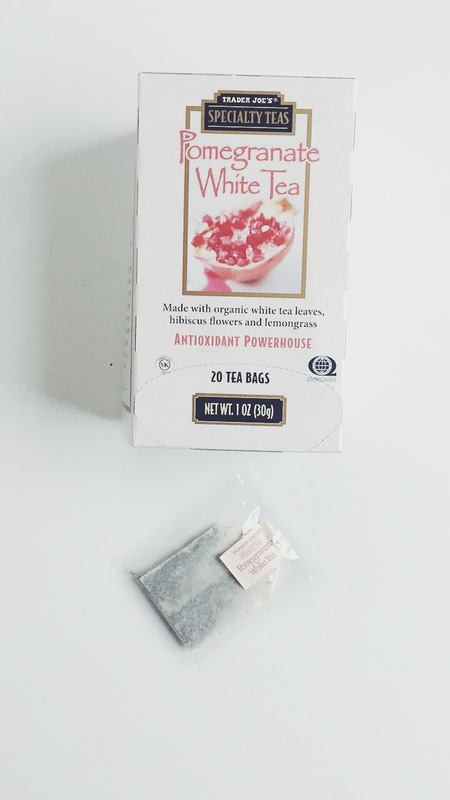 Also, time hack: these organic tea bags (pictured) from Trader Joe’s! This brand from Traditional Medicinals is so the best. It’s so nice and fresh tasting in morning. This is my favorite thing before a workout, when the other options are too heavy to digest. Well, just so good iced, without a drop of sweetener. My fav combo? I make a big pitcher of it on summer mornings and keep it in the fridge. Great for showers and events with strawberries or raspberries in it. From Trader Joe’s too! 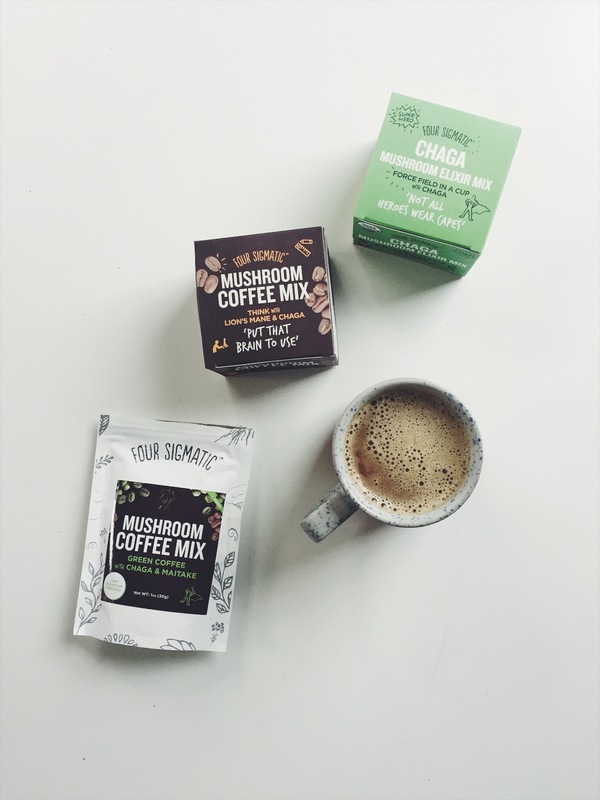 These are mushrooms that are naturally caffeine free, so they’re cool to have anytime of day, or a great option for those that are more sensitive. 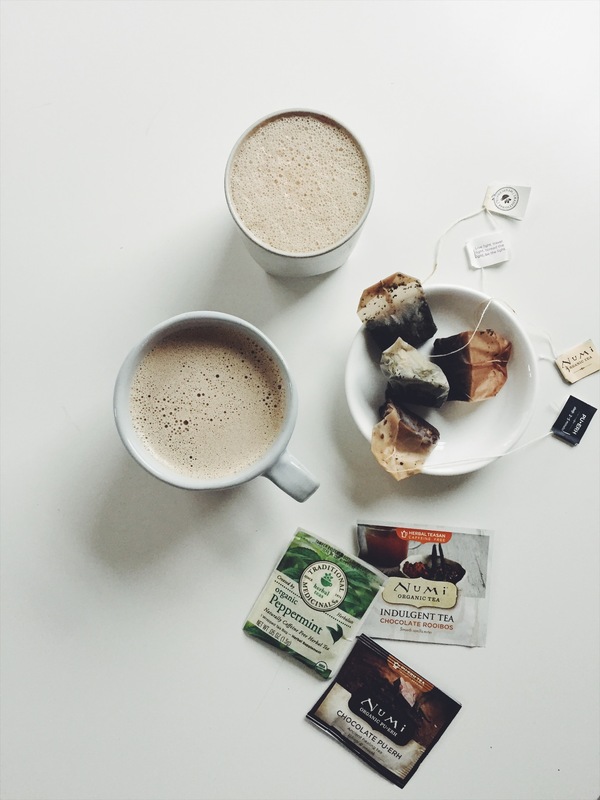 The green Chaga Elixir from Foursigmatic above is my favorite, when I want something heavier than tea but without the caffeine! The other non-caffeine elixirs they have, have stevia in them, which I don’t love. And yes, you can get 10% off any foursigmatic order with the code “simplyrealhealth” at checkout. From Numi tea (another amazing brand), and trust me, you just need this in your collection. It’s caffeine-free and is the perfect little pop of something warm and sweet after dinner, instead of dessert. I adore adding one bag of this plus one bag of the Traditional Medicinals Peppermint Tea. Peppermint hot chocolate tea! I mean, come on. From Yogi. I love this in the mornings or after dinner for digestion. It’s the perfect combo of citrus and spice. Also great iced! My morning routine: wake up, drink 16 oz of water FIRST. Then I “get” to make a morning bev, otherwise I’ll go right for it, and forget about my water in the early part of the day. This is where these drops save me. Adding 10-15 in a big glass of water gives my morning water a taste (not bad or good, just kind of neutral). And chlorophyll itself is such a great blood detoxifier, and red cell builder for your immune system. Basically I feel so proud of myself by 7am for feeding my cells so well, and well– that never starts the day in a bad way. I’ve been loving these drops and the Whole Foods brand ones, because they have a little mint essential oil in them too, so it’s not as taste scary as it looks. not pictured but also in heavy rotation: Traditional Medicinals Organic Peppermint (the best mint tea ever, trust me it’s different & Yogi Organic Ginger Tea (at Trader Joe’s!). My fav combo? mixed with iced tea or coldbrew over ice. Just do it, trust me. Make sure it’s BPA free and guar-gum free. My favorite brand is pictured above, for this reason. Why in the can? It’s pure and simple. And because most of the cartons of milk alternatives are packed full of emulsifiers, shelf stabilizers, gums, sugars and chemicals. Why ruin a good bevvie?! My fav combo? Pop the can in the fridge the night before, and open it and blend in the morning. You’ll get a fluffy cream you can keep in the fridge. 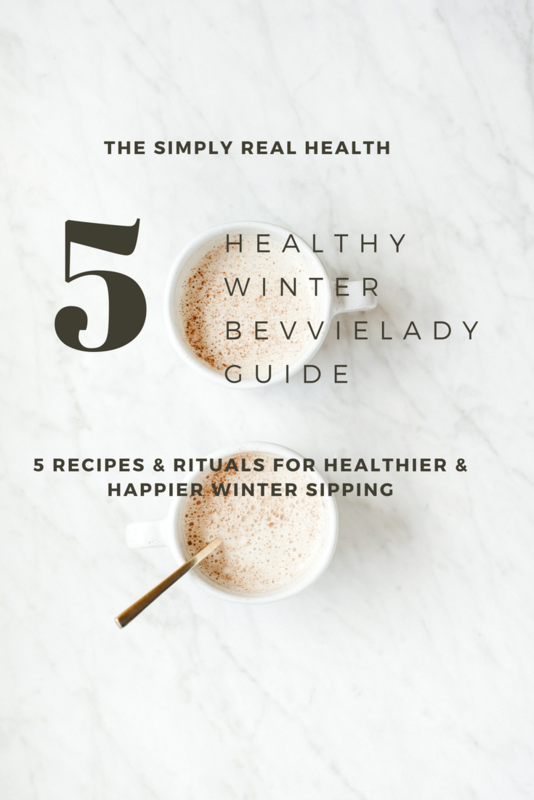 I adore adding 1-2 tablespoons in any bevvie when I want it a little more like a latte. This is one of my favorite add-in’s lately. This one from Vital Proteins is my favorite because it’s organic and all 100% grass-fed (both of which are so important with anything that comes from an animal). Collagen itself is super healing for the gut, your brain, joints, skin and anti-aging, and this powder is tasteless and dissolves so easily into any liquid for a little extra boost. The peptide part is important because it makes it easier for your body to absorb, and works great in both hot or cold bevvies. Bonus? It also has some natural and easy to absorb protein too, to help keep you satisfied, stable and grounded. My fav combo? Add to any beverage, hot or cold, or smoothies too! I only buy this brand, 4th & Heart, because it tastes way better than any other kind I’ve tried. Ghee is like butter, but with the milk solids removed, making it a great option for those that are dairy free, or are wanting to reduce their dairy load if their body doesn’t tolerate a bunch of it well. My fav combo? Use it as you would butter, with 1-2 teaspoons of this melted into your base drink, and blended (it’s creamy and amazing), or over veggies, quinoa, rices, etc. Kerrygold is the most common brand, but all you need are the words “grass-fed” and/or “pastured” (like this one pictured above) and you’ve got yourself a health food. Melt 1-2 teaspoons of butter into your hot morning bev. My fav combo? 1 teaspoon melted into any hot base and blended. Honey/maple syrup, or milk of your choice optional- it will still be creamy without! Note: butter does not work in cold drinks. I adore this kind or this kind because they’re both unrefined, organic and extra virgin, and taste amazing. Coconut oil can be used as a little blending agent, just as butter or ghee, and is a great option to stay dairy free if it bothers you. 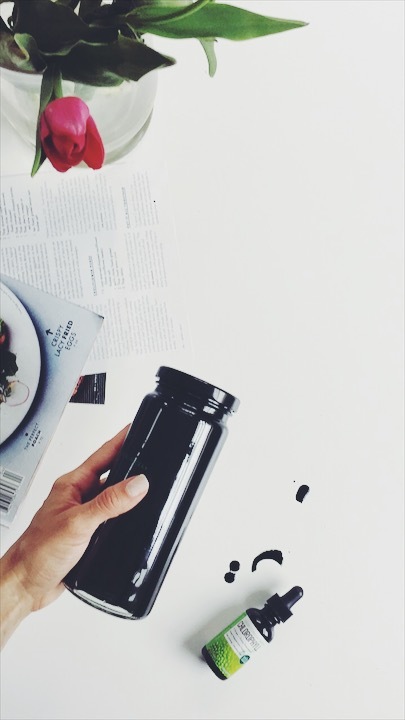 It’s packed full of healthy fats to stabilize your blood sugar and keep you grounded and satisfied (not shaky, jittery and full of anxiety, like most morning drinks leave you). My fav combo? Try 1 teaspoon melted into your hot drink of choice and blended. Note: coconut oil does not work in cold drinks. This is one of my newer favs to the collection, Brain Octane Oil is a MCT and coconut oil, specially formulated to get your brain firing. All of these options (the butter, ghee, coconut oil) will help your brain function and clarity (YAY FOR GOOD FAT), but this one has a little extra boost, that I totally notice. And– best of all, can be blended with cold water for any iced drinks without getting clumpy and weird. For more info and details on adding fats like this to drinks, check out the original Bulletproof blog here, home of the original bulletproof coffee. I highly recommend his new book, Headstrong, if you’re into brain power, having more steady energy throughout the day, etc. 1 heaping teaspoon matchaful powder + 7 oz cold water + 1 teaspoon Brain Octane Oil, blended and poured over ice = iced matcha latte! 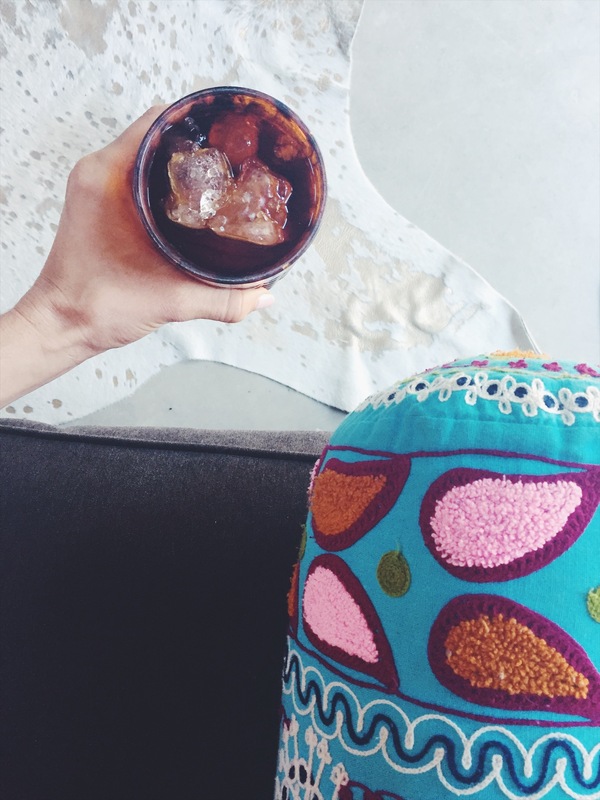 6 oz cold brew + 1 oz coconut water + 1 teaspoon Brain Octane Oil, blended and poured over ice = iced coldbrew latte! Quality sooo matters here. Make sure your version is alcohol free and with real vanilla beans, not imitaion ones/vanilla “flavors”. I like the Frontier brand, or this one. I also adore adding ground vanilla bean powder to any of my drinks, like this kind. It’s great in baking too! Basically, what I’m trying to say, is GET ON THIS BEVVIE TRAIN. 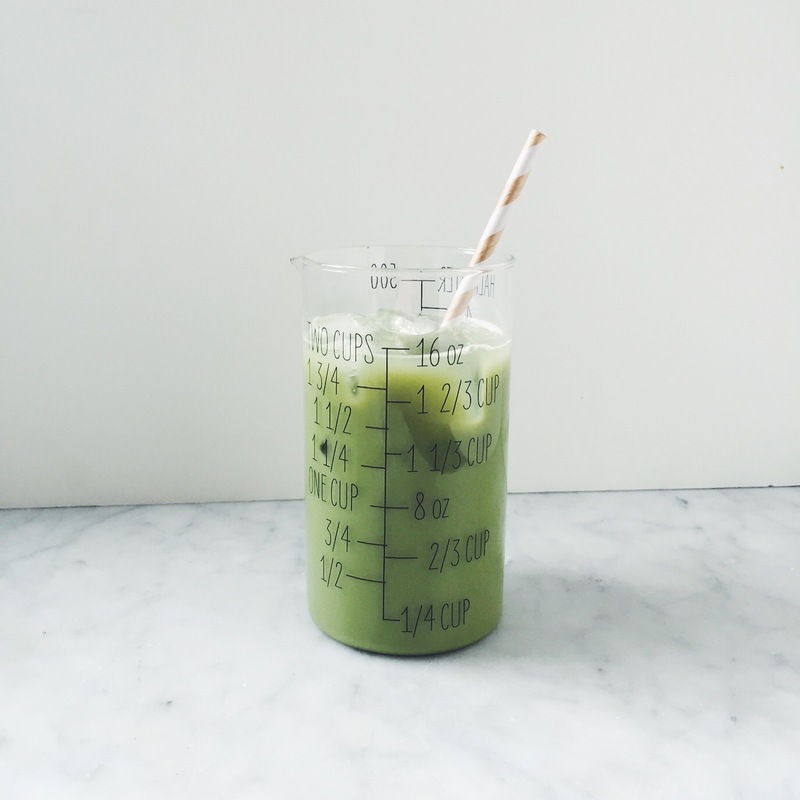 It’s fun and creative, but most of all, upgrading your morning drinks into superfood, super-powered concoctions makes you the same way: more alive, more alert and ready to bring all of that goodness into the other parts of your day (no matter what it entails). And as a ritual in the early part of the day, having a little healthy bevvie routine helps your day get started in a more grounded, nourished way (nutrients wise, blood sugar stable wise, hunger wise, and energy wise), so you can roll right into other good decisions as the hours pass. No #hangry, anxious, jittery, blood sugar crashies on my watch, mm k? Pick and choose a little combo above that works and sounds fun for you. And, I wanna know. How did you feel right after? And did you notice anything different the rest of the day? Little tiny shifts and changes like this can make a huge difference in your life. And it’s all simple, under 5 minutes a day. You’ve got this baby. Let’s go. 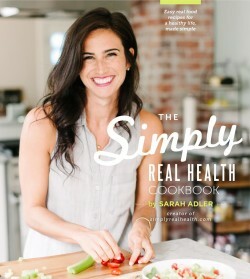 Love these recipe & ideas on a healthy life, made simple? And be sure to register now for my new free webclass this week on How To Eat and Be Healthier without Trying to Hard! You’re the best, thank you so much for taking the time to write that!! Ooh, this post just made me so happy! I just sent it to my husband so that he could read along with me. I’m always giving him little Sarah bevvie tidbits that I pull from your blog and he loves it! 🙂 Last night he said to me, “this might sound a little funny but do you mind if I take the frother to work tomorrow?” Just a few minutes ago, he sent me a pic of his little frothy bulletproof coffee. Ha! So cute. 🙂 As you can see, we’re on board! It’s going to be great having all the tips rounded up into one post for reference, plus some new ones! Thanks, Sarah!! Oh this makes ME so happy! YES 🙂 That was my hope– all the goods in one place for whenever you need a new idea. This makes me sooooo happy. Yessssss!